A scientist who shared this year’s Nobel Prize in Chemistry was a biology graduate student at UC San Diego from 1976 to 1978. 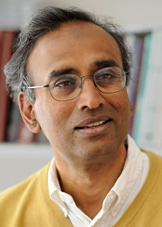 Venkatraman Ramakrishnan of the MRC Laboratory of Molecular Biology in Cambridge, UK, a co-recipient of the 2009 Nobel Prize in Chemistry, worked under Mauricio Montal, a professor of biology at UCSD studying the biochemistry of cell membranes. Ramakrishnan received the chemistry Nobel with Thomas A. Steitz of Yale University and Ada E. Yonath of the Weizmann Institute of Science in Israel for their "studies of the structure and function of the ribosome." The Royal Swedish Academy of Sciences said in its citation that the three scientists “showed what the ribosome looks like and how it functions at the atomic level. All three have used a method called X-ray crystallography to map the position for each and every one of the hundreds of thousands of atoms that make up the ribosome,” an organelle within cells that produces proteins, the chemical building blocks of life. Ramakrishnan received his bachelor’s degree in physics in 1971 from Baroda University in India, his doctorate in physics in 1976 from Ohio University and was a graduate student in biology at UC San Diego from 1976 to 1978. He then left for Yale University, where he was a postdoctoral fellow in chemistry from 1978 to 1982. He is currently a group leader in the Structural Studies Division at the MRC Laboratory of Molecular Biology in Cambridge and a senior research fellow at Trinity College, Cambridge. More information about the 2009 Nobel Prize in Chemistry is available here.